A Miami-area man advertises the services of a tax preparer in this file photo. Despite the federal government shutdown, many taxpayers are on the hook to write Uncle Sam a check Tuesday. Oct. 15 is the filing deadline for more than 12 million individuals who in April requested a six-month extension on their 2012 taxes. The agency said that many of them have yet to file their 1040's for last year. "Payments accompanying paper and e-filed tax returns will be accepted and processed as the IRS receives them," the Internal Revenue Service said in a statement ahead of the deadline. However, if you are expecting some money back, you will likely have to wait until the government reopens. 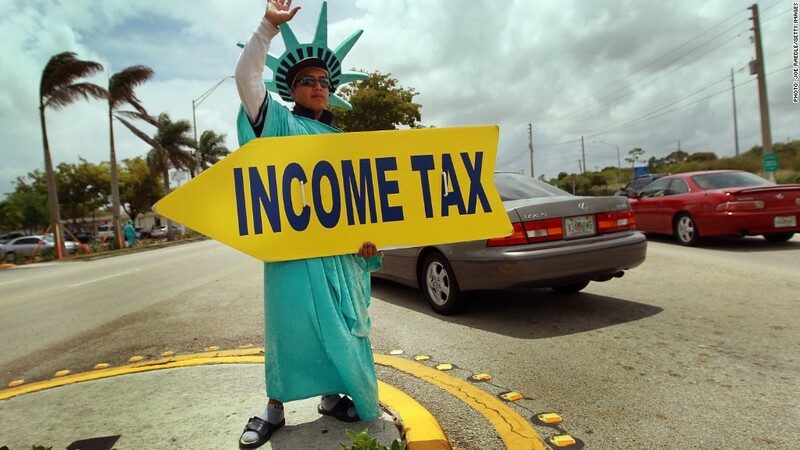 "Tax refunds will not be issued until normal government operations resume," the IRS said. The agency also isn't open to take calls or assist taxpayers in person, but it said the resources on its website and some automated phone lines will remain available. Over 90% of agency's staff is on government-wide furlough due to the federal shutdown. Those still on the clock include over 2,700 law enforcement-related employees and nearly 2,000 employees at submission processing centers, according to the agency's shutdown contingency plan. Additional extensions have been granted to members of the military serving in Afghanistan and also to residents of Colorado impacted by recent storms.